I change the blogs and sites I look at from time to time. 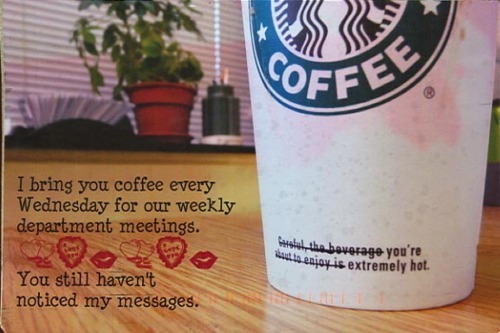 I don’t know how, but I managed to stop following Post Secret and forget all about this amazing site until recently. If you have been following SHP for a few years you will remember I have blogged about this before and even bought the (well one of the) book(s) which is a beautiful book to leaf through. For those of you who have not come across Post Secret, the site came out of a community arts project where Frank Warren invited people to mail their secrets, anonymously, on a postcard. The project ended but the postcards kept coming and so Warren developed a website which now publishes some of the postcard secrets each Sunday. I guess my attention has been drawn back to Post Secret as I think more about confession and forgiveness. Some of the postcards certainly seem to have a confessional element to them. Others are celebrations and some are pleas (a bit like the one I have shown in the pic which makes me feel a bit sad). People go to great lengths to be creative in expressing their secret some of which must take great courage to even put into writing. There is also, I think, something about the vulnerability of the artists in this as there is at least some risk that they will be recognised by a reader. Why do people send in their secrets? Why are these people exposing themselves to risk of exposure? Why do people take such great care to be part of this online community of secret sharers? What are these people hoping to achieve? Is it, as Warren suggests, part of a coping or a healing process? What is it about writing a secret on a postcard and sending it to someone you do not know that has become so ‘popular’ and helpful to some people. the person wants to express them and wishes for them to be seen and heard. There are no doubt more questions that I should be asking, and quite a myriad of possible answers. As I think on this whole area, and chat with people, I am coming to think that part of the answer is a combination of sharing something with another human being and simply being heard. But … is there a spiritual element to this too …. that’s the question I need to dwell on more! This entry was posted in art, confession by robryan65. Bookmark the permalink.